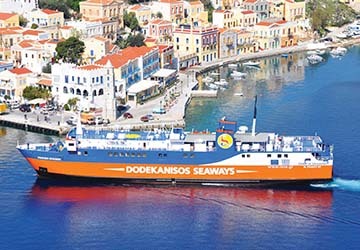 As their name suggests, Dodekanisos Seaways operates numerous ferry crossings around the Dodecanese islands of Greece. Founded in 1999, Dodekanisos Seaways provides scheduled, daily crossings connecting the islands of Rhodes, Symi, Kos, Kalymnos, Leros, Leipsi, Patmos, Agathonisi, Halki, Tilos, Nisyros and Kastelorizo, in the south-eastern Aegean Sea. Offering an extensive timetable, with journey times ranging from just 20 minutes to approximately 4 hours, Dodekanisos Seaways represents a popular choice for travelling within the archipelago. 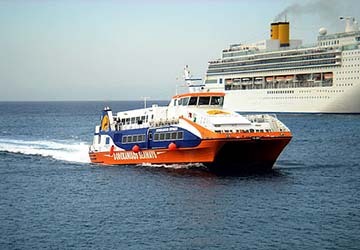 Operating 3 ships called Dodekanisos Express; the first vessel to be introduced, Dodekanisos Pride; a high-speed catamaran enhancing the company’s reputation in 2005, and Panagia Skiadeni; the only Ro/Ro passenger ship of the fleet, the company has become an important part of the lives of locals and tourists on the Dodecanese islands. Furthermore, Dodekanisos Seaways adheres to and exceeds strict environmental guidelines; as a result, they are repeatedly awarded for the social contribution to the region. 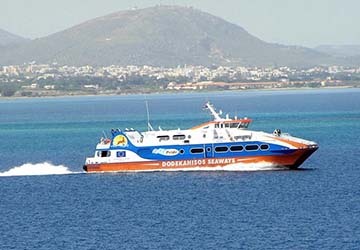 View Dodekanisos Seaways timetables, prices and book Dodekanisos Seaways ferry tickets with directferries.com. Looking for an alternative route or ferry company to fit your plans? Don’t worry, we’ll also compare Dodekanisos Seaways with alternative ferry companies in your search to help you choose.